In honor of this weekend’s Oakland Bay Bridge closure heading westbound, we decided to remember the 75-year-old in better days. As a newborn, she was an engineering marvel and the longest cantilever bridge in the world. Let’s flashback to the four-day long, bridge opening celebration. Julian Lozos, a San Franciscan, shared this cover art from the ceremony program itself. The cover, which Lozos discovered and bought on eBay, is a thing of 1936 deco-beauty. Though I wonder why all the people seem mellow and a bit snobbish. Show some enthusiasm! Next, we go to the Bay Bridge parade route. Another local, Ward Ryan, digitized films about Bay Bridge construction and discovered this lovely parade float. Who are these goddesses adorning the bridge? Do they provide a classy touch or something more? We think they have been replaced by our lucky troll, who currently resides on the bridge itself. Last but not least, we present an image from the Little Miss Bay Bridge contest. Pleasanton resident J. Boles shared this snapshot of his mother, who represented Emeryville and won the contest. She was awarded a nice ribbon by actress Rochelle Hudson, a big deal at the time. So we have proof there were contests well before the Toddlers & Tiaras era. The Bay Bridge has done yeoman’s service, without major changes. Her two decks were revamped over fifty years ago, to remove the trains and accommodate growing vehicle traffic. And we know about the fixes since the 1989 Loma Prieta collapse, necessary but not sufficient for long-term safety. The bridge could only last for a lifetime. On Labor Day 2013, we will marvel at our brand-new, replacement bridge that moves with earthquakes. She will become another shining beacon, complete with open views towards Oakland and the hills. And we’ll all be there, this time. P.S. Tip of the hat, to contributors and posters on Facebook’s Bay Bridge memories. PreviousWWLD: What Would Libby Do? Everyone should scroll through Bennett’s posting, especially the 1930s bridge construction. Thanks for a nice post. 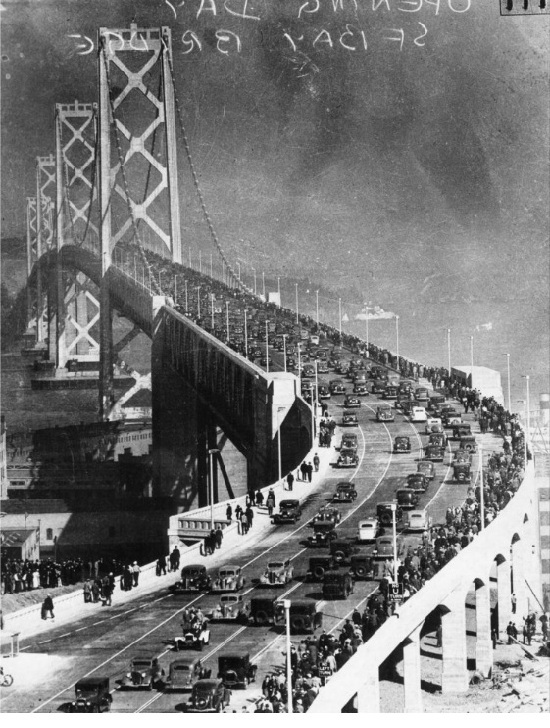 My dad was 17 and lived in Oakland in 1936 when the bridge opened. He and a friend borrowed his friend’s dad’s car to drive across on the first day. The car broke down and they had to call someone to come pick them up. Well into his 80’s it was a memorable day for him. I so hoped they would get the bridge finished in time for him to go across on the first day, but alas, it was not to be. Dad died in 2007 at the age of 88. Very exciting that your Dad was driving across the bridge, and you should keep up the tradition! So I hunted a bit more, and discovered an opening day photo with drivers. Who knows if the car is shown there?